Venice has always attracted tourists across the world to experience its signature lagoon city, however; approximately 70 percent of city is now engulfed with the water due to the storm, leading to the temporary close of the major tourist attractions, including St. Mark’s square. 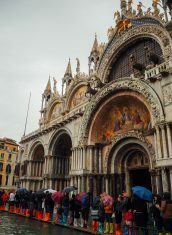 Last Sunday, I took an express train from Milano Centrale, the railway station, to experience the Canal City, Venice, with a slight hope of sun as rain had been falling throughout the whole country, coloring the sky with the low cloud. 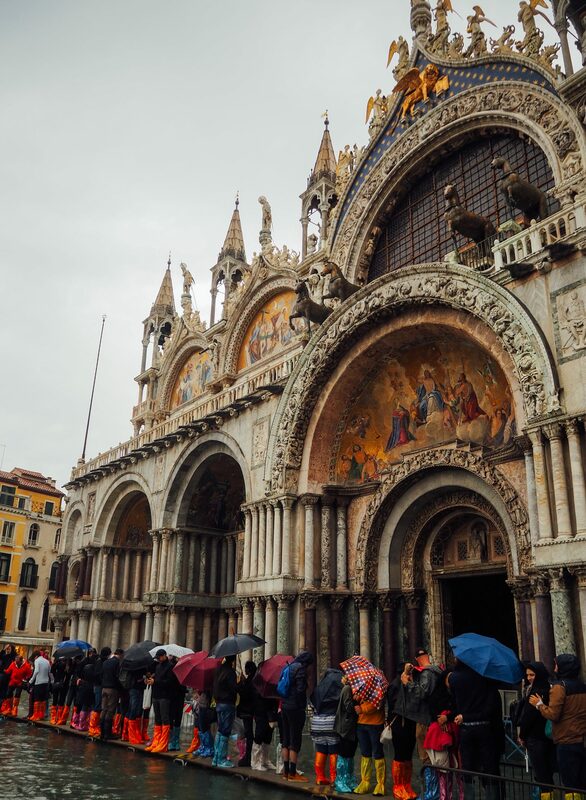 It had been raining the whole night before our departure, yet we didn’t cancel Venice from our itinerary. I had a rough morning getting to the Centrale station, which we should have noticed that it could foreshadow something even worse, however we precede according to our plan. For two hours, we had arrived, yet Venice seemed to be quite grumpy. 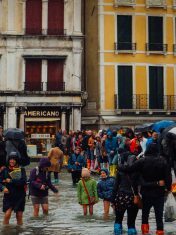 Even though the whole city was covered in rain to the point where the sky looked the same as the water, the storm couldn’t stop the excess amounts of tourists from visiting. 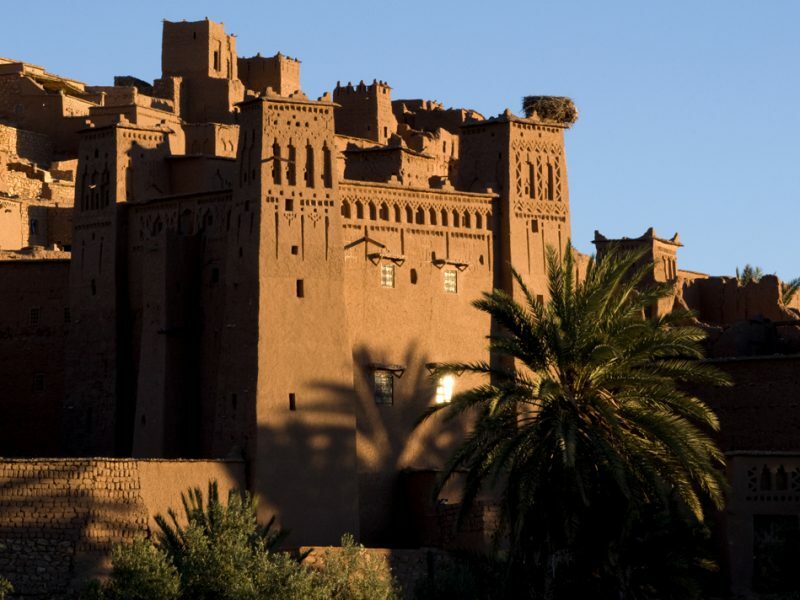 It was crowded as we expected, and most tourists were spotted wearing the colorful high boots. 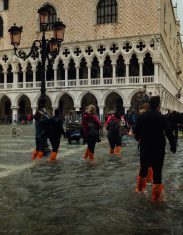 When we arrived at San Marco boat station, we realized that having a pair of that bright rubber boots was a right decision as 3/4 of Piazza of San Marco was then submerged. The boots might be designed to be unstylish but durable enough to make us waddling from alley to alley. Did I mention that Venice Marathon was held on the same day we visited? 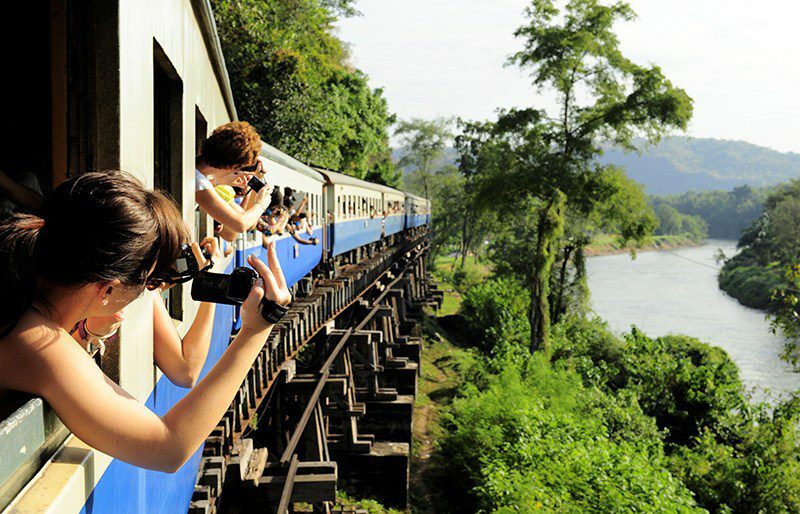 It was such a stunning scenes that the runners were racing through flooded streets, while most tourists had to walk on the provided wooden walkways. Be Careful, it’s slippery!, shouted the Gondola workers whose works seemed to be suspended in the rain. Some tourists tripped over, some accidentally dropped their items in the water, or even worse, their newly purchased bags. We had watched the forecast prior our trip, yet this was beyond our expectation. The rain soaked into my outer and newsboy hat, however the atmosphere was still filled with laughter and joys of visitors who seemed to accept this incident gracefully. The flooded water offered the extraordinary experiences as tourists tried to embrace themselves in this unfortunate event, and the city tried to be functional. 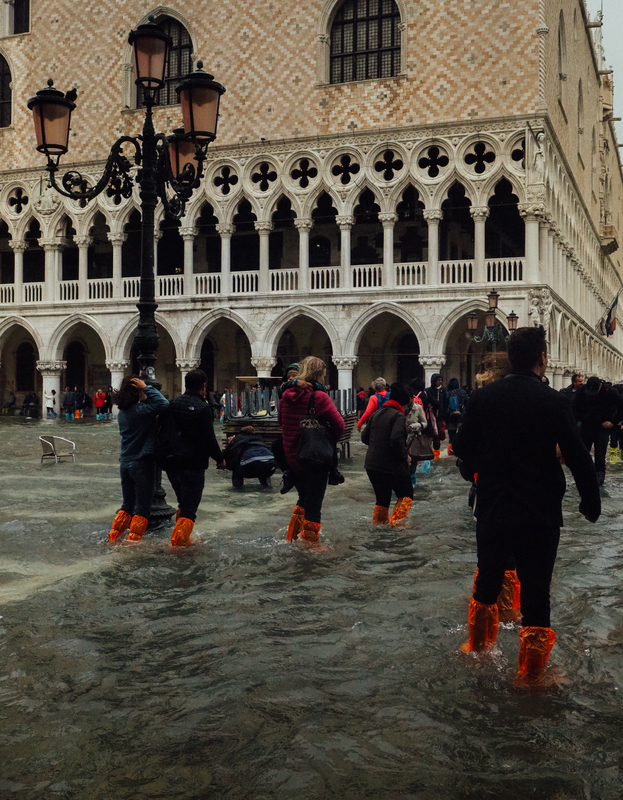 The water was knee-high when I was there, flooding into shops and restaurants where diner can enjoy their pizza with their feet in the water. The shopkeepers also used the bucket to remove water from their shops. 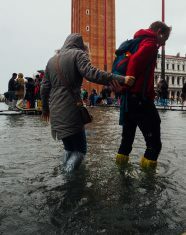 Venice is accustomed with the high water situation, as known as aqua alta, occurring when the winds push water from the lagoon into the canals. The water normally recede within few hours, however; not for this time.The water was knee-deep last sunday but now the flood has been described as the worst hit in a past decade. 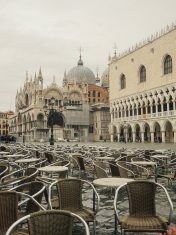 Fear is rising according to the official statement of the Venice city that salt water may cause damage to the historic sites. 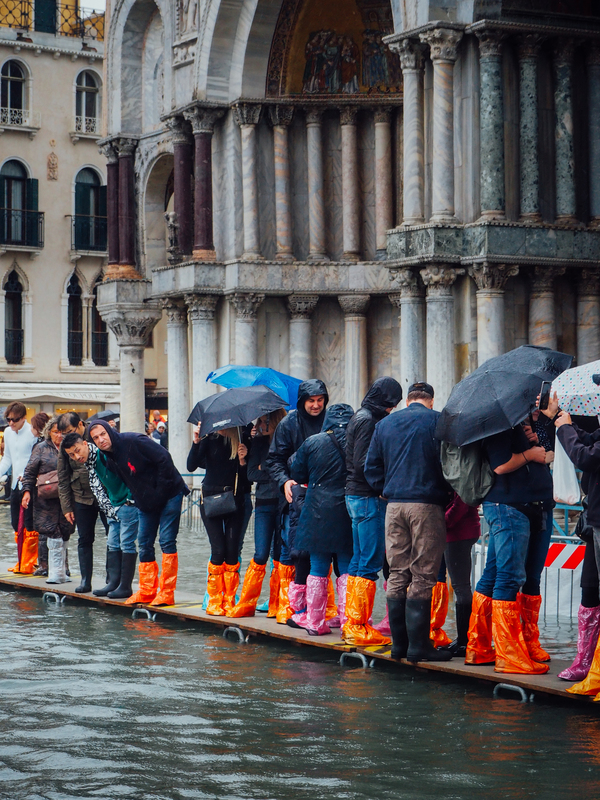 While we all are praying for Venice, for not any loss of precious gems and life, I had been looking through the photographs I took earlier and found that in some phrases of this worst flooding, the generosity and caring can be found even among strangers. 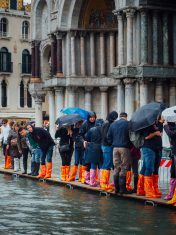 Even though flooding is not infrequent for Venice but the excessive of rain and at this time may leave us some rooms of thoughts about what’s really going on to the planet we live in? Already have planned? 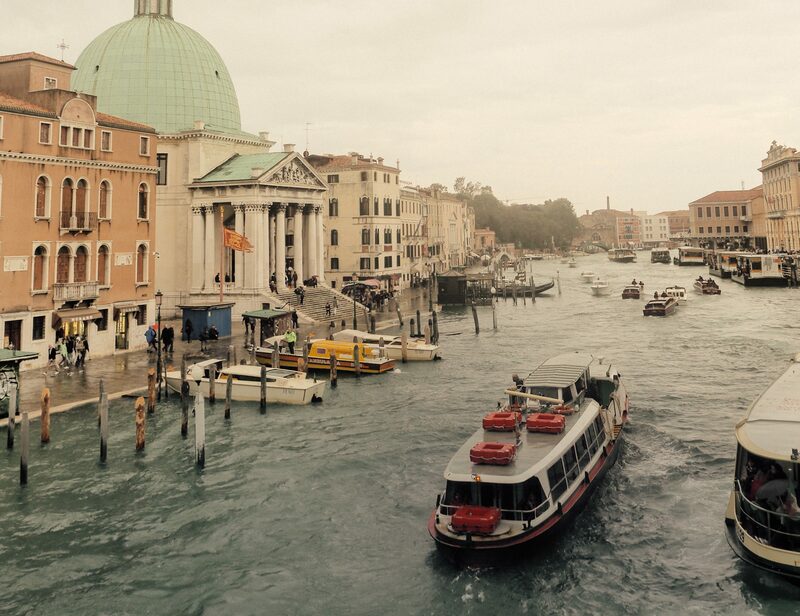 – it is still possible to visit Venice in this period as the aqua alta is expected to over within few days. Some certain areas might be closed thus, frequently checking the weather forecast or visiting the local government website at www.comune.venezia.it/content/centro-previsioni-e-segnalazioni-maree are suggested. Have a safe trip!